Villa with private pool and panoramic view. Free Wi-Fi .satellite TV room with FULL Sky channels, free FULL air-conditioning. A quiet location. The grounds are well laid out to maximize the position and views available. The outside benefits from numerous patio and grass areas. The design is complemented by high quality kitchen, bathrooms and bedroom units. Villa is 5 minutes walk from village square and five minutes drive to Pissouri bay blue flag beach of the restaurants and banks in both these locations. The beach offers an abundance of water sports. There are three excellent golf courses within 15 minutes drive. My name is Andros and this villa is built on my family land. I enjoy spending time here with my family. However is not always occupied by myself and I have decided to share the villa with others who wish to enjoy Cyprus and Pissouri in particular as much as I do. I love this particular site because it is built on the land where my family vineyard once was and it has many happy childhood memories. 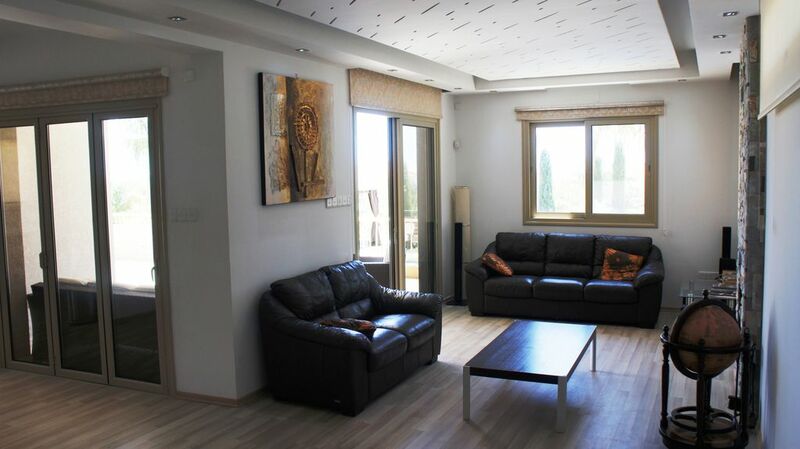 The property has magnificent views of the Mediterranean sea and the Troodos mountain. You are five minutes walk from the village square and a five minutes drive to the beach. Pissouri is location! location! location! We are equidistant from Paphos and Limassol approximately 25-30 minutes drive to each town, 20 minutes from Paphos airport, 45 minutes to Larnaca airport and one hour to Larnaca resort area and the capital Nicosia. Access to the motorway is a picturesque five minutes drive through Pissouri village. There is a computer and work station situated at the property with free access to the internet. En-suite bathroom to bedroom 1 fully tiled with shower and wash handbasin and wc. Main bathroom fully tiled with jacuzzi bath with shower over and wash handbasin and wc. Cloakroom situated ground floor with wash handbasin and wc and storage room. Imposing large lounge with two leather settees and 52 inch tv with surround home theatre, open fire behind glass door, complimented with two coffee tables and fitted tv /audio units. With down lighters and concealed ceiling lighting. Kitchen fully fitted with oven hob washing machine fridge/freezer kettle microwave, sandwich maker and toaster, cutlery and crockery sufficient for more than 8 persons. Dining area to seat six persons with patio door on to patio area and pool. Skiing available during winter months on Troodos approx 45 minutes drive. Three excellent championship golf courses within 15 minutes drive along the B6 from Pissouri to Paphos. All available to non members. Notes on accommodation: Facilities are available to hire cots and high chairs. No central heating but open fire to downstairs and air-conditioning heat/cooling in all Rooms. Separate bbq area and bbq unit are installed. Outside Pagoda situated in pool area with three loungers and six sun beds. Outside: Private swimming pool 9X4 metre, outside dining areas with table and chairs, separate bbq area, 6 sun loungers. All patio areas fully tiled with secure parking areas at the side of the property. Gardens laid mainly to lawn complemented with trees and shrubs. The gardens are level. Cleaning / Towels / Linen / Maid service: Beach towels are provided for use in the pool area.Villa is cleaned before arrival and after departure.Extra maid service can be arranged on request with extra charge.Extra linen and towels are provided for longer than a week stays free of charge. Other: Computer and work station with free internet access situated on the spacious first floor landing area. Villa luxurious and pool and outside areas spacious. A luxurious villa in a peaceful location with only a short walk to the lovely village. All basics provided, loo rolls, kitchen roll, tea, coffee etc so no need to buy. Friendly and helpful owner. We will definitely return. Thank you Andrew. You are all welcome . Perfectly positioned and child friendly. Andreos was very welcoming and helpful. Managed to help out with all our requests. Lovely stay. As all the others reviews have said, the villa is truly outstanding in a quiet situation which makes for a relaxing holiday. The villa has everything you would need and more, and Andros looks after you very well. The hilltop position of Pissouri village gives great views, and all amenities that you will need are within easy reach. A car is very useful, the village centre is a steep walk uphill from the villa, but manageable, and a good supermarket is a short drive away. We certainly hope to return again sometime in the future. You are all welcome any time. Once again we had a fantastic stay at Anelia View villa, Andros as ever was a great host and we instantly felt like we were home. It really is in a wonderful serene setting and offers the perfect place to relax and unwind. Lovely well equipped spacious villa! Just returned from a week in Pissouri in this lovely villa. I went with my two children, aged 21 and 24. We each had a double bedroom which was perfect so we had masses of space. Even with 6 the villa would have been spacious enough. It has lots of indoor and outdoor seating. We loved having the pool to ourselves. The kitchen is spacious and well equipped too. I have stayed in other villas where you have to buy everything from scratch such as loo roll, coffee, sun cream, shower gel, shampoo, washing up liquid, condiments etc - but this villa had everything which was so handy so check before you go to the supermarket. Andros, the owner is extremely welcoming and happy to answer any questions at any time. He bought us a welcome pack of essentials which was gratefully received as we were quite tired when we arrived and meant we didn’t have to go straight to the supermarket. Andros is very honest too as I had booked an extra night (although we weren’t going to be there) because our flight wasn’t until 22.30 and we wanted the villa for the whole day. On our last day I told Andros that we weren’t actually staying the extra night that I had booked and he insisted on giving me back €100 in cash. What an absolute star! Pissouri itself is perfect, the beach is really beautiful and clean, sun beds €2, with restaurants nearby should you need them. My son went scuba diving with Pissouri Bay Divers who he thought were excellent. The actual village is up the hill from the villa. Go to The Bunch of Grapes restaurant and walk round the square afterwards - absolutely charming and picturesque! Pissouri has many other good restaurants too, aswell as an amazing supermarket selling everything you could wish for including gorgeous fresh pittas, fresh meat and fish, and feta from the delicatessen. There are also 2 petrol stations, pharmacy and recycling facilities nearby. All in all we had a fabulous time here and and definitely hope to return one day. You are all welcome anytime. We really enjoyed our stay here and didn't want to leave. Beautiful spacious villa in a quiet location but only 10 mins walk (uphill) to the village bars and restaurants. Thank you Andros, we will be back. 3 minutes drive to beach. Paphos 20 minutes and Troodos 45 minutes drive. Taxis available from village and beach. Pissouri village has supermarkets, bakery, greengrocers, pharmacy, doctors surgery, three banks with ATM. The village square is pedestrianised and boasts numerous good quality restaurants and bars. Pissouri Bay are several good quality restaurants and bars and four mini markets and car hire offices. The village can be accessed via concrete steps situated two minutes from the villa. Booking Notes: Prices are advertised and payable in UK pounds per week and paid direct to the owner. Deposit of 25% required to secure booking, balance payable 8 weeks prior to arrival. Longer lets are available and subject to availability (Please discuss with the owner). Changeover Day: Access to the villa on day of arrival is at 4 pm (earlier times maybe accommodated if possible, Please discuss with the owner). Departure is 12 noon, late departures maybe available depending on bookings. Notes on prices: Price is for the villa per week in UK pounds. Owner's Cancellation Policy 0% refund for cancellations after 30 days from the booking confirmation.